The question of Turkey's relationship with the jihadist group Hay'at Tahrir al-Sham is controversial. The 'de-escalation' zone originally envisioned for Idlib province presumed that Turkey would take action to undermine Hay'at Tahrir al-Sham. On the other hand, critics argue that Turkey is essentially cooperating with the group. 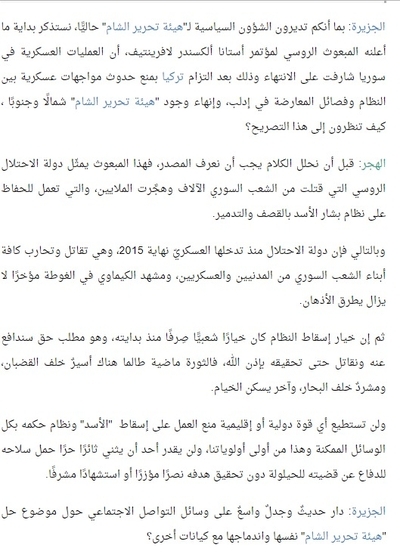 This post provides primary texts in translation that show how Hay'at Tahrir al-Sham officials present the nature of the group's relationship with Turkey. Of course, it does not follow that we should take all their words at face value. Nor should it be presumed that all members of Hay'at Tahrir al-Sham accept the lines of reasoning presented by these officials. But these texts should be of use to the reader. Any explanatory insertions by me are in square brackets. This post will be updated when new, relevant texts emerge. What is the ruling of the insertion of Turkish [military observation] points into the liberated areas as Sheikh Abu al-Fatah al-Farghali mentioned previously that their insertion has specific conditions, so are these conditions still valid? And is the jihad continuing? 1. That the military superiority in the liberated areas should be for the mujahideen and not the secular Turkish army. 2. That the Turks should not intervene in ruling or administering the liberated areas in any circumstances or forms (the meaning of the condition is that there should not happen any infringement on the implementation of the rule of [God's] law in the liberated areas. 3. That the decision of peace and war in the liberated areas should be in the hands of the mujahideen and not the Turkish army (as is the case in the other areas [e.g. 'Euphrates Shield' zone] that it has entered). And on every allowance for the increase in the number of points the Majlis Shura [consultation council] of the commission [Hay'at Tahrir al-Sham] and fatwa council met on the matter to be sure of the continuation of the conditions and compliance with the red lines. This matter did not vary except in two points that were inserted at the time of the commission's fighting the aggressors as they were inserted in areas that were not under the control of the commission and it was very difficult for the commission to control their entry or manage it as was the case in the stable circumstances. Despite that, the commission managed by God's grace at that time to direct the placement of the points in the least harmful place. - For we still have the military superiority over the points that have been inserted, for the points have no direct geographic connection with the original army, just as the entry and departure of their replacements is through us, and likewise the areas they have been placed in allow us to have superiority over them. - The Turks have no role in administering the liberated areas. - And the decision to begin any new operation or halt operations for the Shari'i interest is in the hands of the mujahideen entirely, by God's grace. But there remains upon the mujahideen entirely an important issue in the end- and it is obligatory upon them- that they should continue in making preparations and strengthening their force, their coherence and the unity of their ranks- so that the jihad can continue and the word of God over all the lands that the disbelievers and Nusayris occupy should be supreme. And there is no power or force except in God. al-Jazeera Arabic interview with Yousef al-Hajar, head of the administration of political affairs for Hay'at Tahrir al-Sham (May 2018). As of 4 June 2018, the interview appears to have been removed from al-Jazeera's website, and Yousef al-Hajar has not commented on its removal. Q: In as much as you direct political matters for Hay'at Tahrir al-Sham currently, we recall firstly what the Russian envoy for the Astana conference Alexander Lavrentiev declared: that the military operations in Syria are nearing their end once Turkey complies with preventing the occurrence of military confrontations between the regime and the opposition factions in Idlib, and the presence of Hay'at Tahrir al-Sham in the north and south is put to an end. How do you view this statement? A: Before we analyse these words, we must know the source, for this envoy represents the Russian occupation state that has killed thousands of the Syrian people and displaced millions, and works to preserve the regime of Bashar al-Assad through bombing and destruction. Thus, the occupation state, since its military intervention at the end of 2015, has been fighting and waging war on all the sons of the Syrian people from civilians and combatants. And the chemical scene in Ghouta recently is still fresh in people's minds. Thus, the choice to bring down the regime was a popular, pure choice from its outset, and it is a righteous demand that we will defend and fight for until it is realized by God's permission, for the revolution continues so long as there is a prisoner behind bars, a displaced person beyond the seas, and another living in the tents. And no international or regional force will be able to prevent efforts to bring down al-Assad and the regime of his rule by all possible means and this is among our first priorities. And no one will be able to prevent a free revolutionary from bearing his arms to defend his cause to prevent him from realizing his aim: a hard-won victory or a dignified martyrdom. Q: There have been widespread talk and controversy on social media about the subject of Hay'at Tahrir al-Sham dissolving itself and its being merged with other entities? 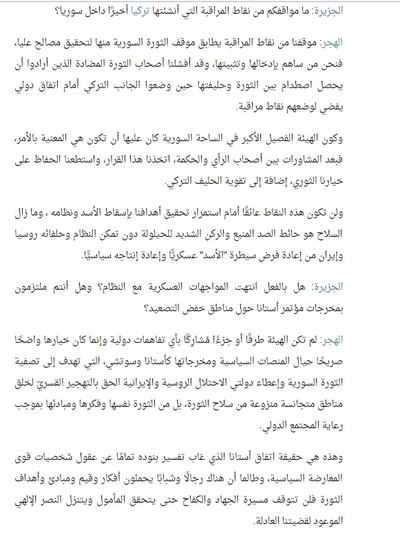 A: We deny what has been recently circulated about the existence of merger or front formation talks between the commission [Hay'at Tahrir al-Sham] and any of the fighting Syrian factions in this stage, and the matters that concern the organizational basis of Hay'at Tahrir al-Sham are not subject to negotiation or bartering outside the commission's internal house and [these matters are] within the foundations and principles on which it arose, with our keenness and insistence on realizing the interest of our revolutionary people in what protects their jihad and noble revolution. And we in Hay'at Tahrir al-Sham have been wholly keen and at all major stages of the Syrian revolution to hasten to realize the popular calls demanding to end the revolutionary chaos that liberated northern Syria lives through and unite the revolutionary ranks to prevent them from being exposed to international and regional pressures and the tensions that will come about from the force of the revolution and its internal balance, and this requires for us to bear our responsibilities better than at any past time. Q: What has occurred between you and the Turks and on what have you agreed and negotiated? A: Relations with Turkey are balanced and continuing in what realizes security and stability in liberated northern Syria, and the joint historical links between the Muslim Turkish and Syrian peoples have a deep extension in the depth of history itself. And the most outstanding manifestations of those links are what happened during the years of the Syrian revolution, as Turkey has formed a true depth for the Syrian revolution despite the change in its political positions, to say nothing of its hosting of millions of Syrian refugees and protection of their dignity. Q: What are your positions on the observation points that Turkey has established recently inside Syria? A: Our position on the observation points matches the position of the Syrian revolution, including for the realization of higher interests, for we are the ones who participated in inserting them and establishing them, and we foiled the counter-revolutionaries who wanted a confrontation to happen between the revolution and its ally when they put the Turks before an international agreement requiring for them to put in place observation points. And since the commission is the biggest faction in the Syrian field, it had to be concerned with the matter, so after consultations between those of opinion and wisdom, we took this decision, and we were able to preserve our revolutionary choice, in addition to strengthening the Turkish ally. These points will not be an obstacle before continuing to realize our aims in bringing down al-Assad and his regime, and arms remain the invincible wall and the strong pillar to prevent the regime and its allies Russia and Iran from re-imposing al-Assad's control militarily and its resumption politically. Q: Have military confrontations with the regime really ended? And are you complying with the outcomes of the Astana conference concerning the de-escalation zones? A: The commission was not a party or participant in any international understandings but rather its choice was clear and frank concerning the political platforms and their outcomes like Astana and Sochi that aim to liquidate the Syrian revolution and give the Russian and Iranian occupation states the right by forced displacement to create homogeneous zones devoid of the arms of the revolution, and also of the revolution itself, its ideas and principles as per the oversight of the international community. And this is the truth of the Astana agreement, the interpretation of its clauses having been completely absent from the minds of the personalities of the forces of political opposition. And so long as there are men and youth who bear the thoughts, values, principles and aims of the revolution, the path of jihad and struggle will not cease until the hope is realized and the divine promised victory for our just cause comes down. Q: What is the fate of Hay'at Tahrir al-Sham after the recent international understandings? And what is your view on preventing the north of Syria from experiencing a catastrophic fate similar to the fate of Raqqa? A: After the geographical alignment of the Syrian revolution, the displacement of the revolution's people by force, and the confinement of its political and military gravity to Idlib, this requires us to put in place a comprehensive plan to save the revolutionary support bases and protect the authentic people of the revolution in order to build its capabilities, rehabilitate it, realize the dignified life, reduce its sufferings, heal its bleeding wounds, protect its dignity and freedom, participate in realizing the aims of its revolution, and that is so by its clinging, steadfastness and definitive faith in the victory of the revolution and its principles. And we are determined to reject the transferring of the international and regional conflict into the Syrian interior and making it a field for events and settling of scores of interests that are conducive to the partition of Syria into zones of influence and control far removed from the interests and desires of the revolutionary Syrian people, preventing the realization of the aims of the greatest popular revolution over time. We in Hay'at Tahrir al-Sham, as an authentic part of the Syrian revolution, say very clearly that we will not allow the East Ghouta and north Homs countryside scenario to be repeated in liberated northern Syria, and we will expend blood and lives to prevent that. And we will strive to realize the higher interests of the Syrian revolution and they are tantamount to national security for it, embodied in protecting the security and safety of the people of the revolution, the bearers of the authentic values and lofty principles in its two fundamental battles: the battle of liberation from all forms of internal and external occupations, and the battle of building and construction to promote a high-end civilizational experience that best represents the Syrian revolution. And that is so in the unity of its political and military decision-making and the administration of the liberated areas in what realizes the desires of the revolutionaries and accords with their great sacrifices in the shade of the Shari'a of the Merciful One, and in accordance with our authentic identity and culture. 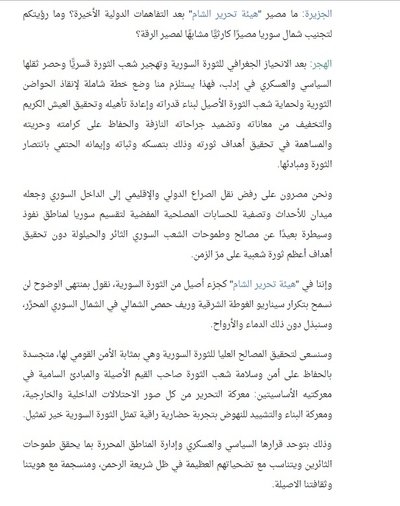 (8 June 2018): Hay'at Tahrir al-Sham Shari'i council on "Jihad and Shari'i politics between constants and variables." Though the ruling does not explicitly mention Turkey, it does discuss the issue of relations with foreign states, and so is relevant here. Praise be to God who has guided us to Islam, and then has guided us to the path of the Ahl al-Sunna wa al-Jama'a, and has then guided us to the method of the way of might: jihad in God's path. We ask God for acceptance, steadfastness, the right way, and success. - The reference of Shari'a is one of our constants that is not changed, not in a state of tamkeen [realization of power] and not in a state of vulnerability, and we will never be part of a system that does not adopt reference for itself from Islam. - Our faith in jihad as a path for change is one of our constants that likewise is not changed between tamkeen and vulnerability, with the adoption of all that is in the interest of the jihad so long as it does not conflict with the Shari'a from the politics and jurisprudence of necessity. - Capability is a variable not a constant, and the rulings of Shari'a are dependent on Shari'i capability, so if capability changes, one takes from the rulings what is appropriate to it, which some imagine to be a change in ruling, but it is not so, whereas others consider it to be going back on and abandoning the manhaj. So we must distinguish between the ruling in its original theoretical state and the ruling in the state it is brought down on an applicable situation that is mindful of the preceding aspect of capability, just as it is also mindful of the existence of necessity in this situation or lack thereof. So the reference of Shari'a is a constant, and the principle of jihad is a constant, but capability on which rulings are dependent is a variable. And so long as the mujahideen are steadfast on the Shari'a of jihad and possess the determination and will to continue on the path with their seeking help in God and their constant summoning of the Exalted's company, there is no fear on them for what has come to them from the scheming of the enemies. And as we wish to balance between what has come before and what realizes the interests of this jihad, we adopt some choices of reasoning that allow us to continue it in the shade of this blessed revolution, not ignoring the jihad of the one who wages jihad in any inch and land and in any time and occasion, for the jihad of al-Sham has come in the shade of a popular revolution that arose against a criminal regime, but it would not have come to what it is today except after the series of jihad of the predecessors and jihad of the masses of the mujahideen in many regions of the abode of Islam. For all Muslims in the world are our brothers in religion and all the mujahideen are our brothers in religion and the path, and so we establish relations between us and the other groups on the basis of brotherhood in faith and loyalty to the believers, and this bond is strengthened in our situation with the groups that we consider are still adopting jihad as a principle and path of the Sunna for change and possess the will to continue. And we hope that these relations reach the level of 'unity', and if it does not reach that, then no less than alliance and mutual compact to support the oppressed from the Muslims will do. And our attempt to neutralize some of the adversaries during the different stages of our jihad does not necessarily mean identifying with them, following them and realizing their demands and desires, for our path is clear, and it is summarised in continuing in this jihad without going back on the principles of Islam, and without contravening the rulings of Islam: jihad to push back from the Muslims the aggressor enemy. For Shari'i politics is a part of jihad, and jihad is a part of Islam, and indeed it [jihad] is its utmost pinnacle. 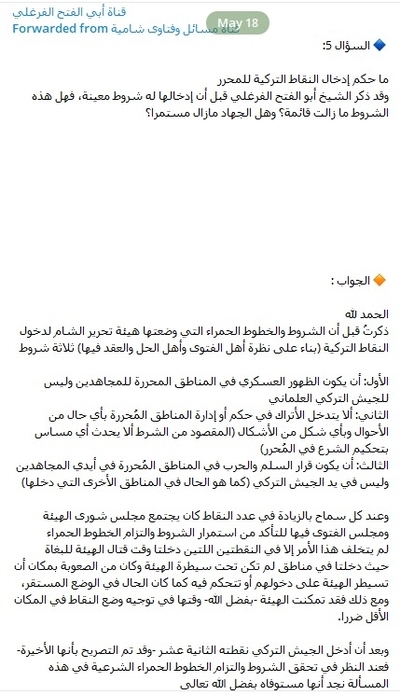 There has been much talk about the nature of relations with some of the states, and to clarify this we say: the general framework for these relations is defined through the extent to which those relations secure considered interests of this revolution and this jihad, and the extent of the evils they bring about, within the rulings of the pure law. So we possess our decision in our hands and weapons, and we do not work according to the dictates of anyone, but rather we assess our situation and the interests of this jihad and the interests of the Ahl al-Sunna. And we work to the satisfaction of God Almighty according to that, with our belief in the possibility of the convergence of some of the interests between us and others in what does not conflict with our religion and constants. And indeed our military compass is directed to fight the criminal regime and its allies, and this has a great connection with relations with others, for the one whose interests meets with us in this framework even if only in some aspects, it is possible to build relations with that party within the framework that serves that compass, and all this is so as long as those relations do not reach the point that is not permitted by the law, and among it that the evils derived from those relations should exceed the interests. 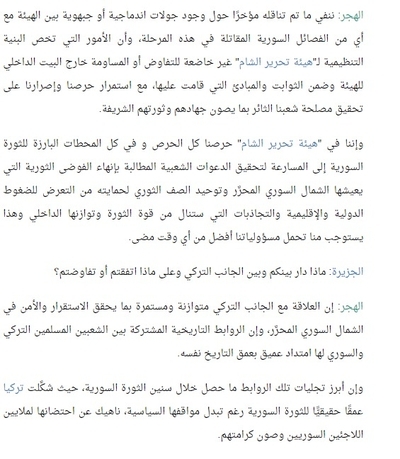 America's classification of Hay'at Tahrir al-Sham on the terrorism lists is undoubtedly to be condemned but it is not surprising, for America is the one that stands against the restoration of any of the Muslims' rights and wages war with all its power to prevent that, and it is the one that classifies on its terrorism list- officially or practically- every force of the Ahl al-Sunna, and this classification will not divert us from following the path of jihad, and will not impact us and our determination hereafter as before, and there is no distinction, God willing. And in the prior stages we did not undertake the steps we took intending to escape the classification or in fear of it, but rather to realize what we consider to be in the interests of the jihad in realizing the unity of the mujahid groups. And we know that the reason America is hostile to us from principle is our religion and manhaj, but also what makes it more hostile to us besides that principle is the fact that we do not follow the path it wants, as the requirement of the conduct of the path of jihad is not to submit to pressure and dictates. And in conclusion, we are a group waging jihad in God's path. As humans we may err and do the right thing, and the error comes at the level of the individual and at the level of the group, and there is no infallibility except for the prophets (peace be upon them), and the goal is not to continue in error after it has become clear, not to attain the status of infallibility. And we do not claim infallibility for our choices and efforts of reasoning, but rather we strive to seek truth according to what we know from our religion. So if we get it right, so God's grace has been sincere, so we ask from Him the benefit two rewards. And if we err, so we ask for the reward from the Exalted, in that we ask Him for forgiveness and for our good senses to inspire us. Indeed He is hearing and responsive, and He is the One who guides to the right path. And God's blessings and salutations be upon our Prophet Muhammad, his companions and family. 23 Ramadan 1439 AH/8 June 2018 CE.